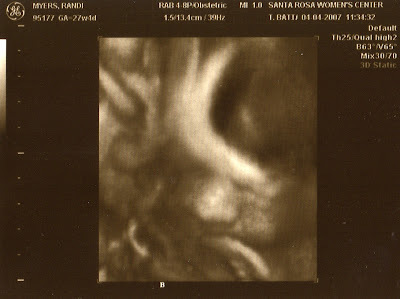 Randi and I went to our 3D/4D ultrasound today with a doctor that Randi calls on for work. The technician, although, was one of the women that works for our perinatalogist and was the biggest reason we decided to have it there. We took our VHS tape in with us ready to chronicle the miracles of modern technology...not exactly. They have a long way to go before that technology is perfected. Most of the pictures looked like Van Gogh, and we needed an art history professor to explain what we were looking at. Our expectations for the prints must have been too high. We got a few good shots of Tigger, as he was the most cooperative. Pooh was being a little more difficult, and we have no pictures of him. He is tucked into Randi pretty deep and is facing her spine. This must be why it is so hard to get a heart rate for him. I guess there is still no substitute for the real thing. 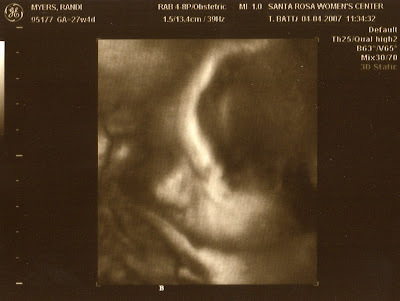 Well, this is my 1st visit to your blog, and in the hour I have spent peeking into your twins experience I have laughed and cried....I am so excited for you and know that you will be wonderful parents! Tigger's 4D is very handsome, definately moms nose and dads forehead:)I'm quite sure little pooh bear is just as adorable, he's just camera shy. You keep cookin' and they'll be here healthy and strong before you know it! Love to you both, and to the boys!